Hwy 80 and North College Ave. 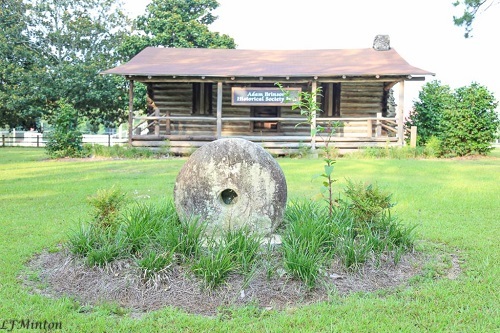 The Adam Brinson Historical Society was formed in 2011 to preserve a unique log cabin located on US 80 E in Historic Twin City. The cabin was built in 1934 using pine logs that were felled during a 1929 tornado in Emanuel County. The land was donated and the cabin constructed by families of the newly formed chapter of the NSDAR as a meeting place for their members until 2010. The design is that of a pioneer cabin featuring a large fieldstone fireplace. Antiques have been donated over the years including cowhide chairs, a stage-coach table, and spinning wheel. The cabin also houses historical documents and artifacts. Local schools use tours of the cabin to bring history alive for their students, and the cabin is open for festivals and by appointment. Nestled within the 23-acre Carilee Coleman Park is the John Rountree log house, a one-story, three-bay, double-pen saddlebag log house. The cabin, which was built c. 1830, is unusual for its construction. The logs are joined with diamond-notching and are not chinked, but sealed with wood battens applied mostly on the interior. A large brick chimney rises through the center of the house and would have heated both the north and south rooms. The house is set on hewn pine sills and raised on concrete block piers. The front porch runs the full width of the house and features chamfered posts; the side-gable roof is covered with sheet metal. The house never had plumbing, although there is evidence that it may have had a rudimentary electrical system added early in this century. The hand-dug well supplied water for the family. John Rountree, the builder of this log house, was named after his grandfather, who was born in Pennsylvania. John Sr. emigrated to Tar River, North Carolina, then to Greene County GA, and finally to Emanuel County, GA. Only two of his six children, Joshua and George, arrived with him in Emanuel County. Joshua had six children, including John Rountree, who built the log house. The house may have been built at the time of John’s marriage to Nancy Brown Kent in 1832. This log home is significant for several reasons: It is an outstanding example of an early 19th century log saddlebag dwelling, one of the most distinctive and easily recognizable house types in Georgia; the diamond notching used in its construction is an unusual method of construction in Georgia (less than ten examples are known to survive); and it is the oldest surviving building in Emanuel County, representing first or second generation settlement in the region. The cabin is independently listed on the National Register of Historic Places. The park has picnic shelters, restrooms, and trails and is slated to undergo restoration. Visit the George L. Smith State Park page for more information.